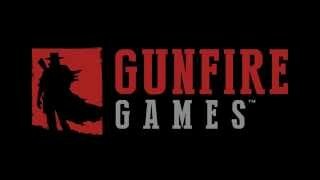 //When Gunfire Games wanted to animate their silhouetted cowboy logo, they came to us. We transformed their logo from a static image into a classic western scene at high noon, with the wild west wind blowing fiercely and a surly cowboy on a slow stroll into a duel, ready to shoot. For their logo bumper, we created an entire scene around the iconic silhouette. We built the scene like a motion comic, with a character moving meaningfully through an animated background. We lent the full traditional animation touch to the cowboy and the crowing vulture, both rendered by hand in Flash. Check out the animation here, or pick up an Oculus Rift and experience it before any of the upcoming titles from Gunfire Games!